Charlotte is a beautiful town that sits on Lake Champlain, just 10 miles from Burlington and 25 minutes from Middlebury. 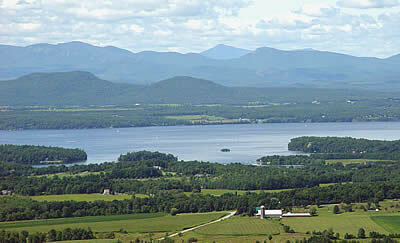 Many of the back roads traversing the town of Charlotte are scenic with views of Camel's Hump and Lake Champlain. It's no wonder that the drive through town along Rte 7 is often referred to as one of the most scenic drives in Vermont. The central and quaint downtown has its own general store with great gourmet food and international wines. There are beautiful views of the lake and the Adirondacks, as well as Thompson's Point, a summer community on the lake. Search the latest listings for sale in Charlotte, VT below. If you have any questions or would like more information on a property - contact us. You can also sign up for a free account to save your top listings and get updates when similar listings come on the market. This Vintage Charlotte barn has been thoughtfully converted and updated to a 5 bedroom home sited on 7.5 acres that are mixed pasture and woods. Many new improvements and updates since Fall 2011 have made this a great home with many possibilities. Improvements and upgrades include new windows on the 1st level, new insulation on all floors, wide pine flooring on the 1st floor, expanded space on the 3rd floor and most important, the installation of a built-in wood fired masonry/soapstone combination heating and cook stove. Not only does this stove provide an even supply of radiant heat during the winter months, it creates a focal point in the otherwise open Great Room and also the centerpiece of the newly defined kitchen space. While the barn now has approx 4700sf of living space,there is still tons of unfinished barn space under the same roof. This additional space makes great dry storage as is but could house a shop, studio, or in-home business.The possibilities are staggering!